A month ago I was lucky enough to win a a Revlon nail polish from Miss Bliss! It's from the Nail Art Chalkboard collection and has black polish at one end and white at the other - chalkboard colours. I was really excited to try it out, but unfortunately I was in the middle of my December challenge at the time and had to wait. But now that we're well into January I finally have a chance to post it! I like it. It's really handy having the polish doubled sided; one side is black with a normal brush and the other end is white with a thin nail art brush. The polish has a matte finish, very accurate for a chalkboard. 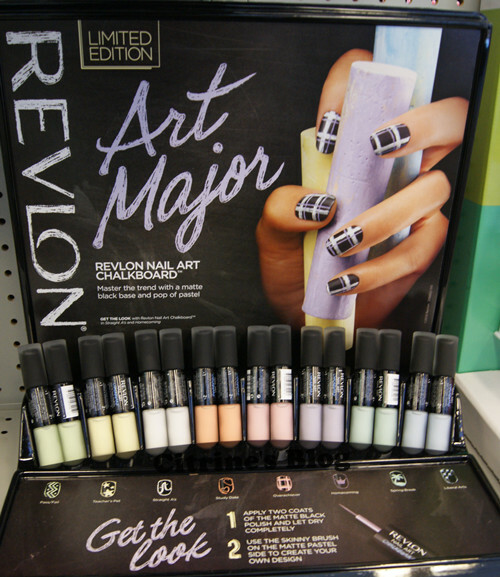 I think it was a smart move by Revlon to make the bottles double sided, because when push comes to shove they're simply matte nail polishes; but having the two-in-one combo makes them distinctly themed. These polishes also comes in heaps of other colours, as you can see here. It's useful to just have to pick up one polish to do an entire design, especially if you're going somewhere else to do it. Here's the bottle(s) they come in! As you can see, my design was relatively unoriginal but fun and easy. Any so that's my little kind-of-review for this, in case some of you were thinking of buying some of these polishes. The one I've got is great, and if I catch them on sale (I'm a bit stingy, haha) I'll be buying more ☺. Thanks for the prize, Melissa!